Matto Mildenberger, Mark Lubell and Michelle Hummell. 2019. Global Environmental Change. One potential barrier to climate policy action is that individuals view climate change as a problem for people in other parts of the world or for future generations. As some scholars argue, risk messaging strategies that make climate change personally relevant may help overcome this barrier. In this article, we report a large-n survey experiment on San Francisco Bay Area residents to investigate how providing spatially-resolved risk information to individuals shapes their climate risk perceptions in the context of sea-level rise. Our results suggest that personalized risk messaging can sometimes reduce concern about sea-level rise. 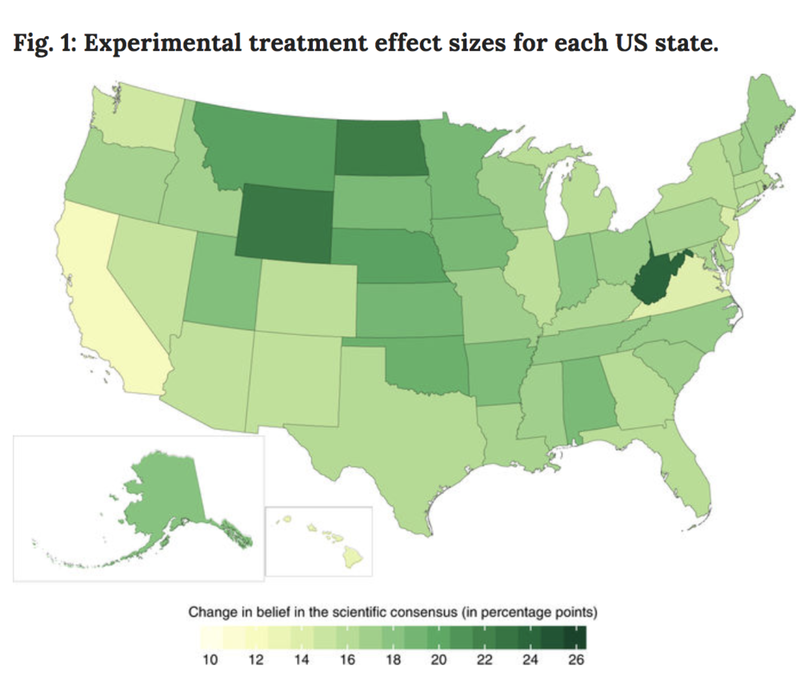 These experimental effects are limited to respondents who believe that climate change is happening. Further, we do not find an effect of providing local risk messages on an individual's willingness to pay for regional climate adaptation measures. Our results emphasize that local messaging strategies around sea-level rise risks may not have the clear impacts that some advocates and scholars presume. Alexander Hertel-Fernandez, Matto Mildenberger and Leah C. Stokes. 2019. American Political Science Review. Legislative staff link Members of Congress and their constituents, theoretically facilitating democratic representation. Yet, little research has examined whether Congressional staff actually recognize the preferences of their Members’ constituents. Using an original survey of senior US Congressional staffers, we show that staff systematically mis-estimate constituent opinions. We then evaluate the sources of these misperceptions, using observational analyses and two survey experiments. Staffers who rely more heavily on conservative and business interest groups for policy information have more skewed perceptions of constituent opinion. Egocentric biases also shape staff perceptions. Our findings complicate assumptions that Congress represents constituent opinion, and help to explain why Congress often appears so unresponsive to ordinary citizens. We conclude that scholars should focus more closely on legislative aides as key actors in the policymaking process, both in the United States and across other advanced democracies. Energy resource debates sit at the center of both policymaking and electoral battles across North America. Yet in contrast to Europe, strong international institutions to manage continental energy policy have not developed. Instead, North American energy politics are shaped by four key factors: the federalist nature of North American countries, the absence of effective continental energy institutions, regional economic interdependence, and the relative power asymmetries between the United States and its neighbors, Canada and Mexico. Taken together, these features of North American energy regionalism distinguish it in both form and dynamics from energy politics in Europe and Asia. The North American energy system is an example of regional energy management in which a single dominant state pulls neighbors into a fragmented institutional framework. Nicole Goodman and Leah C. Stokes. 2018. British Journal of Political Science. Voting models assume that voting costs impact turnout. As turnout declined across advanced democracies, governments enacted reforms designed to reduce costs in order to increase participation. Internet voting, used in elections across a dozen countries, promises to reduce voting costs dramatically. Yet identifying its effect on turnout has proven difficult. In this article, we use original panel data of local elections in Ontario, Canada and fixed effects estimators to estimate internet voting’s effect. The results show internet voting can increase turnout by 3.5 percentage points, with larger increases when vote by mail (VBM) is not yet adopted, and greater use when registration is not required. Our estimates suggest that internet voting is unlikely to solve the low turnout crisis, and imply that cost arguments do not fully account for recent turnout declines. Baobao Zhang, Sander Van Der Linden, Matto Mildenberger, Jennifer Marlon, Peter Howe and Anthony Leiserowitz. 2018. Nature Climate Change. Social science scholars routinely evaluate the efficacy of diverse climate frames using local convenience or nationally representative samples. For example, previous research has focused on communicating the scientific consensus on climate change, which has been identified as a ‘gateway’ cognition to other key beliefs about the issue. Importantly, although these efforts reveal average public responsiveness to particular climate frames, they do not describe variation in message effectiveness at the spatial and political scales relevant for climate policymaking. Here we use a small-area estimation method to map geographical variation in public responsiveness to information about the scientific consensus as part of a large-scale randomized national experiment (n = 6,301). Our survey experiment finds that, on average, public perception of the consensus increases by 16 percentage points after message exposure. However, substantial spatial variation exists across the United States at state and local scales. Crucially, responsiveness is highest in more conservative parts of the country, leading to national convergence in perceptions of the climate science consensus across diverse political geographies. These findings not only advance a geographical understanding of how the public engages with information about scientific agreement, but will also prove useful for policymakers, practitioners and scientists engaged in climate change mitigation and adaptation. Leah Stokes and Hannah Breetz. 2017. Energy Policy. We examine the politics of US state and federal policy supporting wind and solar in the electricity sector and biofuels and electric vehicles in the transportation sector. For each technology, we provide two policy case studies: the federal Production Tax Credit (PTC) and state Renewable Portfolio Standards (RPS) for wind; state Net Energy Metering (NEM) and the federal investment tax credit (ITC) for solar; federal excise tax incentives and the Renewable Fuel Standard (RFS) for biofuels; and California's Zero Emission Vehicle (ZEV) mandate and federal tax incentives for electric vehicles. Each case study traces the enactment and later revision of the policy, typically over a period of twenty-five years. We use these eight longitudinal case studies to identify common patterns in the politics of US renewable energy policy. Although electricity and transportation involve different actors and technologies, we find similar patterns across these sectors: immature technology is underestimated or misunderstood; large energy bills provide windows of opportunity for enactment; once enacted, policies are extended incrementally; there is increasing politicization as mature technology threatens incumbents. Even as US partisan polarization shapes climate and energy attitudes, substantial heterogeneity in climate opinions still exists among both Republicans and Democrats. To date, our understanding of this partisan heterogeneity has been limited to analysis of national- or, less commonly, state-level opinion poll subsamples. However, the dynamics of political representation and issue commitments play out over more finely resolved state and local scales. Here we use previously validated multilevel regression and post-stratification (MRP) models (Howe et al., Nat Clim Chang 5(6):596–603 2015; Mildenberger et al., PLoS One 11(8):e0159774 2016) combined with a novel approach to measuring the distribution of party members to model, for the first time, the spatial distribution of partisan climate and energy opinions. We find substantial geographic variation in Republican climate opinions across states and congressional districts. 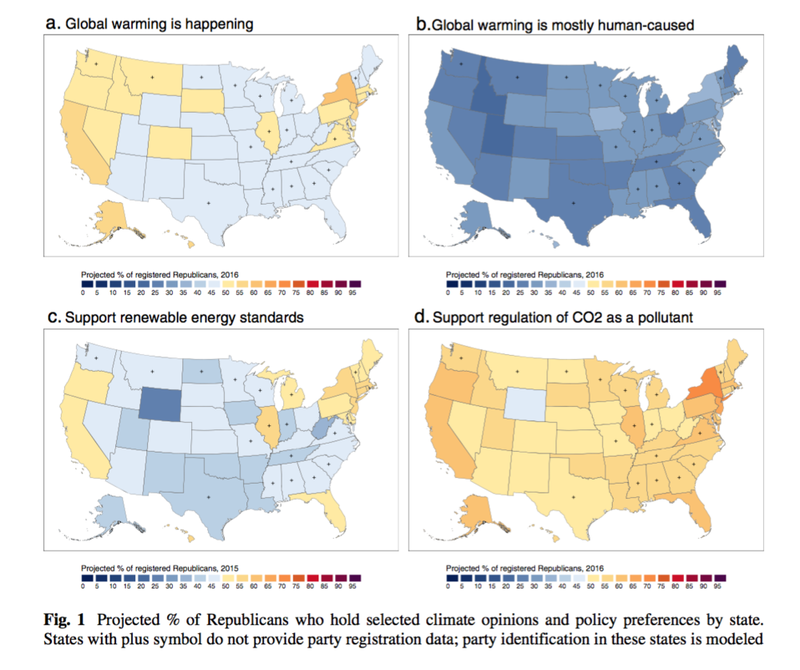 While Democratic party members consistently think human-caused global warming is happening and support climate policy reforms, the intensity of their climate beliefs also varies spatially at state and local scales. These results have policy-relevant implications for the trajectory of US climate policy reforms. When political action entails individual costs but group-contingent benefits, political participation may depend on an individual’s perceptions of others’ beliefs; yet, detailed empirical attention to these second-order beliefs – beliefs about the beliefs of others – remains rare. We offer the first comprehensive examination of the distribution and content of second-order climate beliefs in the United States and China, drawing from six new opinion surveys of mass publics, political elites, and intellectual elites. We demonstrate that all classes of political actors have second-order beliefs characterized by egocentric bias and global underestimation of pro-climate positions. 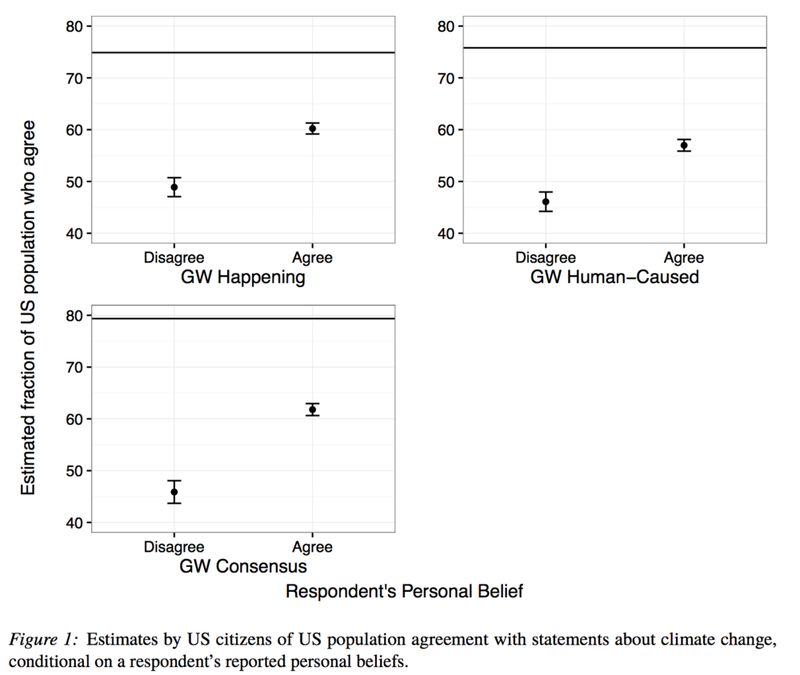 We then demonstrate experimentally that individual support for pro-climate policies increases after respondents update their second-order beliefs. We conclude that scholars should focus more closely on second-order beliefs as a key factor shaping climate policy inaction and that scholars can use the climate case to extend their understanding of second-order beliefs more broadly. Leah C. Stokes and Christopher Warshaw. 2017. Nature Energy. The United States has often led the world in supporting renewable energy technologies at both the state and federal level. However, since 2011 several states have weakened their renewable energy policies. Public opinion will probably be crucial for determining whether states expand or contract their renewable energy policies in the future. Here we show that a majority of the public in most states supports renewable portfolio standards, which require a portion of the electricity mix to come from renewables. However, policy design and framing can strongly influence public support. Using a survey experiment, we show that effects of renewable portfolio standards bills on residential electricity costs, jobs and pollution, as well as bipartisan elite support, are all important drivers of public support. In many states, these bills’ design and framing can push public opinion above or below majority support. Matto Mildenberger and Anthony Leiserowitz. 2017. Environmental Politics. Does the state of the economy condition public concern for the environment? Scholars have long argued that environmental preferences decline during economic downturns as individuals prioritize short-term economic needs over longer-term environmental concerns. Yet, this assumption has rarely been subjected to rigorous empirical scrutiny at the individual level. The presumed link between economic and environmental preferences is revisited, using the first individual-level opinion panel (n = 1043) of US climate attitudes, incorporating both self-reported and objective economic data. In contrast with prior studies that emphasize the role of economic downturns in driving environmental preference shifts, using a stronger identification strategy, there is little evidence that changes in either individual economic fortunes or local economic conditions are associated with decreased belief that climate change is happening or reduced prioritization of climate policy action. Instead, the evidence suggests that climate belief declines are associated with shifting political cues. These findings have important implications for understanding the dynamics of political conflict over environmental policy globally. Leah C. Stokes. 2016. American Journal of Political Science. Retrospective voting studies typically examine policies where the public has common interests. By contrast, climate policy has broad public support but concentrated opposition in communities where costs are imposed. This spatial distribution of weak supporters and strong local opponents mirrors opposition to other policies with diffuse public benefits and concentrated local costs. 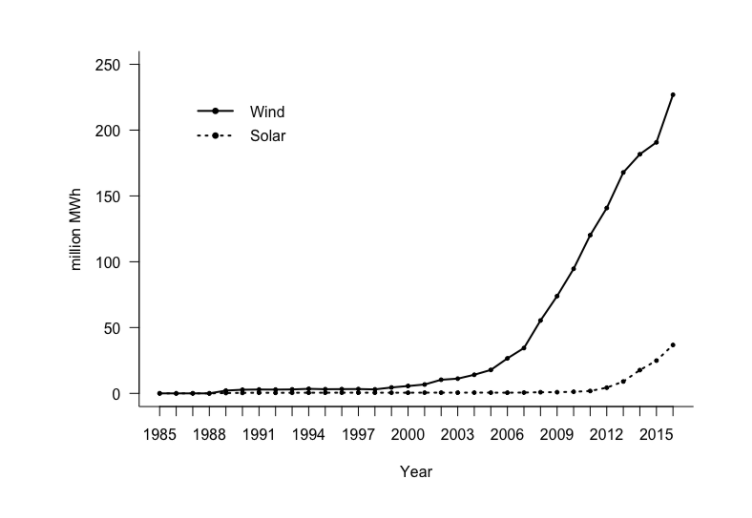 I use a natural experiment to investigate whether citizens living in proximity to wind energy projects retrospectively punished an incumbent government because of its climate policy. Using both fixed effects and instrumental variable estimators, I identify electoral losses for the incumbent party ranging from 4 to 10%, with the effect persisting 3 km from wind turbines. There is also evidence that voters are informed, only punishing the government responsible for the policy. I conclude that the spatial distribution of citizens' policy preferences can affect democratic accountability through ‘spatially distorted signalling’, which can exacerbate political barriers to addressing climate change. Leah C. Stokes, Amanda Giang and Noelle E. Selin. 2016. Global Environmental Politics. International environmental negotiations often involve conflicts between developed and developing countries. However, considering environmental cooperation in a North-South dichotomy obscures important variation within the Global South, particularly as emerging economies become more important politically, economically, and environmentally. This article examines change in the Southern coalition in environmental negotiations, using the recently concluded Minamata Convention on Mercury as its primary case. Focusing on India and China, we argue that three key factors explain divergence in their positions as the negotiations progressed: domestic resources and regulatory politics, development constraints, and domestic scientific and technological capacity. We conclude that the intersection between scientific and technological development and domestic policy is of increasing importance in shaping emerging economies’ engagement in international environmental negotiations. We also discuss how this divergence is affecting international environmental cooperation on other issues, including the ozone and climate negotiations. Noelle E. Selin, Leah C. Stokes, & Lawrence E. Susskind. 2016. WIREs Climate Change. An increased focus on ‘policy literacy’ for climate scientists, parallel to ‘science literacy’ for the public, is a critical need in closing the science–society gap in addressing climate mitigation. We define policy literacy as the knowledge and understanding of societal and decision-making contexts required for conducting and communicating scientific research in ways that contribute to societal well-being. We argue that current graduate education for climate scientists falls short in providing policy literacy. We identify resources and propose approaches to remedy this, arguing that policy literacy education needs to be mainstreamed into climate science curricula. Based on our experience training science students in global environmental policy, we propose that policy literacy modules be developed for application in climate science curricula, including simulations, case studies, or hands-on policy experiences. The most effective policy literacy modules on climate change will be hands-on, comprehensive, and embedded into scientific education. Matto Mildenberger, Peter Howe, Erick Lachapelle, Leah Stokes, Jennifer Marlon, Timothy Gravelle. 2016. PLOS ONE. While climate scientists have developed high resolution data sets on the distribution of climate risks, we still lack comparable data on the local distribution of public climate change opinions. This paper provides the first effort to estimate local climate and energy opinion variability outside the United States. Using a multi-level regression and post-stratification (MRP) approach, we estimate opinion in federal electoral districts and provinces. We demonstrate that a majority of the Canadian public consistently believes that climate change is happening. Belief in climate change’s causes varies geographically, with more people attributing it to human activity in urban as opposed to rural areas. Most prominently, we find majority support for carbon cap and trade policy in every province and district. By contrast, support for carbon taxation is more heterogeneous. Compared to the distribution of US climate opinions, Canadians believe climate change is happening at higher levels. This new opinion data set will support climate policy analysis and climate policy decision making at national, provincial and local levels. Peter Howe, Matto Mildenberger, Jennifer Marlon & Anthony Leiserowitz. 2015. Nature Climate Change. Addressing climate change in the United States requires enactment of national, state and local mitigation and adaptation policies. The success of these initiatives depends on public opinion, policy support and behaviours at appropriate scales. Public opinion, however, is typically measured with national surveys that obscure geographic variability across regions, states and localities. Here we present independently validated high-resolution opinion estimates using a multilevel regression and poststratification model. The model accurately predicts climate change beliefs, risk perceptions and policy preferences at the state, congressional district, metropolitan and county levels, using a concise set of demographic and geographic predictors. The analysis finds substantial variation in public opinion across the nation. Nationally, 63% of Americans believe global warming is happening, but county-level estimates range from 43 to 80%, leading to a diversity of political environments for climate policy. These estimates provide an important new source of information for policymakers, educators and scientists to more effectively address the challenges of climate change. Amanda Giang, Leah C. Stokes, David G. Streets, Elizabeth S. Corbitt, & Noelle E. Selin. 2015. Environmental Science and Technology. 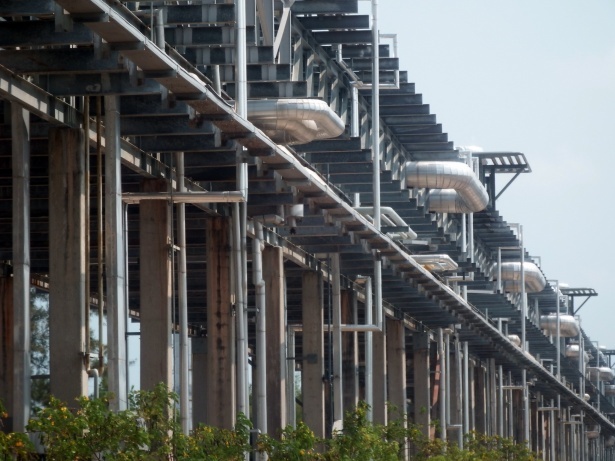 We explore implications of the United Nations Minamata Convention on Mercury for emissions from Asian coal-fired power generation, and resulting changes to deposition worldwide by 2050. We use engineering analysis, document analysis, and interviews to construct plausible technology scenarios consistent with the Convention. We translate these scenarios into emissions projections for 2050, and use the GEOS-Chem model to calculate global mercury deposition. Where technology requirements in the Convention are flexibly defined, under a global energy and development scenario that relies heavily on coal, we project ∼90 and 150 Mg·y–1 of avoided power sector emissions for China and India, respectively, in 2050, compared to a scenario in which only current technologies are used. Benefits of this avoided emissions growth are primarily captured regionally, with projected changes in annual average gross deposition over China and India ∼2 and 13 μg·m–2 lower, respectively, than the current technology case. Stricter, but technologically feasible, mercury control requirements in both countries could lead to a combined additional 170 Mg·y–1 avoided emissions. Assuming only current technologies but a global transition away from coal avoids 6% and 36% more emissions than this strict technology scenario under heavy coal use for China and India, respectively. Jonathan Leader-Maynard & Matto Mildenberger. 2016. British Journal of Political Science. Dedicated research on ideology has proliferated over the last few decades. Many different disciplines and methodologies have sought to make a contribution, with the welcome consequence that specialist thinking about ideology is at a high-water mark of richness, diversity and theoretical sophistication. Yet this proliferation of research has fragmented the study of ideology by producing independent communities of scholars differentiated by geographical location and by disciplinary attachment. This review draws together research on ideology from several disciplines on different sides of the Atlantic, in order to address three questions that appear to be of great relevance to political scientists: (1) What do we mean by ideology? (2) How do we model ideology? (3) Why do people adopt the ideologies they do? In doing so, it argues that many important axes of debate cut across disciplinary and geographic boundaries, and points to a series of significant intellectual convergences that offer a framework for productive interdisciplinary engagement and integration. Leah C. Stokes & Noelle E. Selin. 2014. Journal of Environmental Studies and Sciences. Environmental negotiations and policy decisions take place at the science-policy interface. While this is well known within academic literature, it is often difficult to convey how science and policy interact to students in environmental studies and sciences courses. We argue that negotiation simulations, as an experiential learning tool, are one effective way to teach students about how science and policy interact in decision-making. We developed a negotiation simulation, called the mercury game, based on the global mercury treaty negotiations. To evaluate the game, we conducted surveys before and after the game was played in university classrooms across North America. For science students, the simulation communicates how politics and economics affect environmental negotiations. For environmental studies and public policy students, the mercury simulation demonstrates how scientific uncertainty can affect decision-making. Using the mercury game as an educational tool allows students to learn about complex interactions between science and society and develop communication skills.